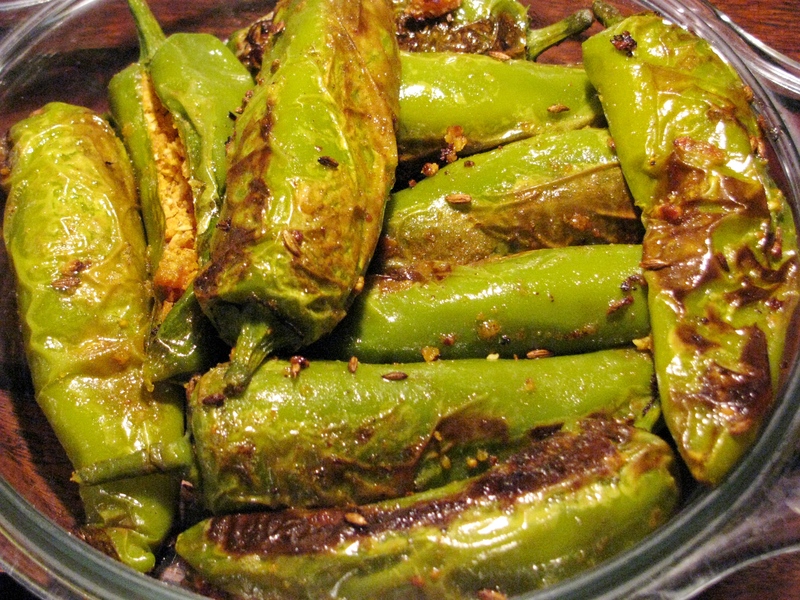 Stuffed green chili is a tasty recipe which is made in variety of ways in different parts of india. 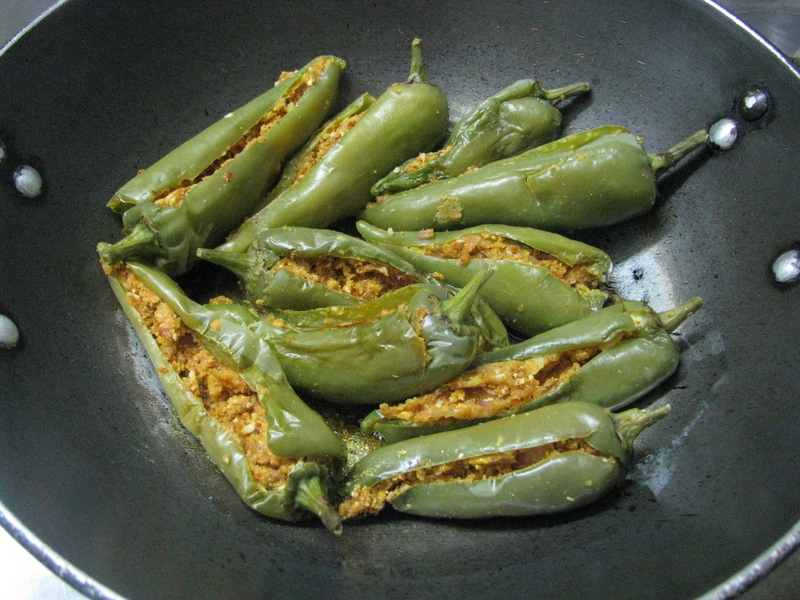 in hindi this stuffed chili recipe is called as bharwa mirch , in Marathi it is called as bharli marchi or bhareleli mirchi & in gujarati it is called as bharela marcha. This recipe varies as you travel in different parts of india . 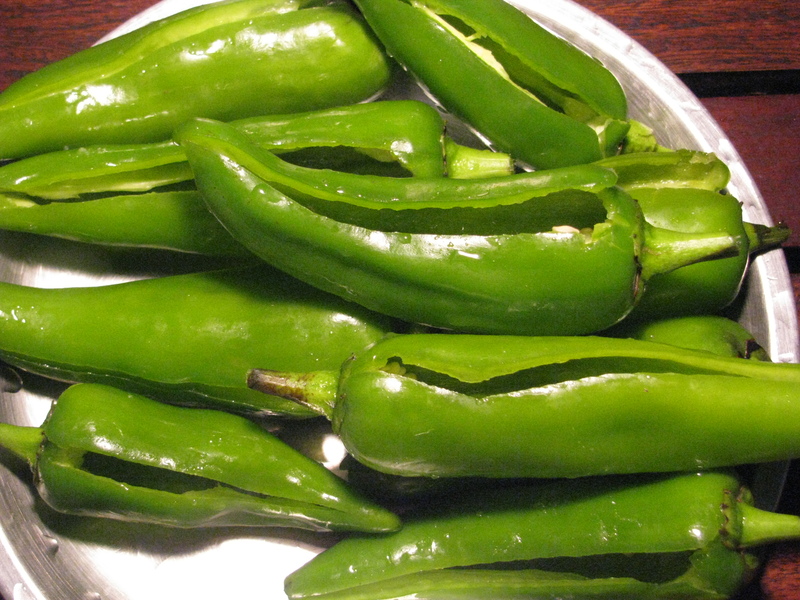 In Maharashtra and Gujarat bhavnagri mirch (chili) is used to make this stuffed chili recipe . Generally besan (gram flour) , grated coconut , and crushed peanut is mixed with different spices and tang of lemon juice , amchur or imli is added to it .This stuffed pepper is a tasty veg recipe . 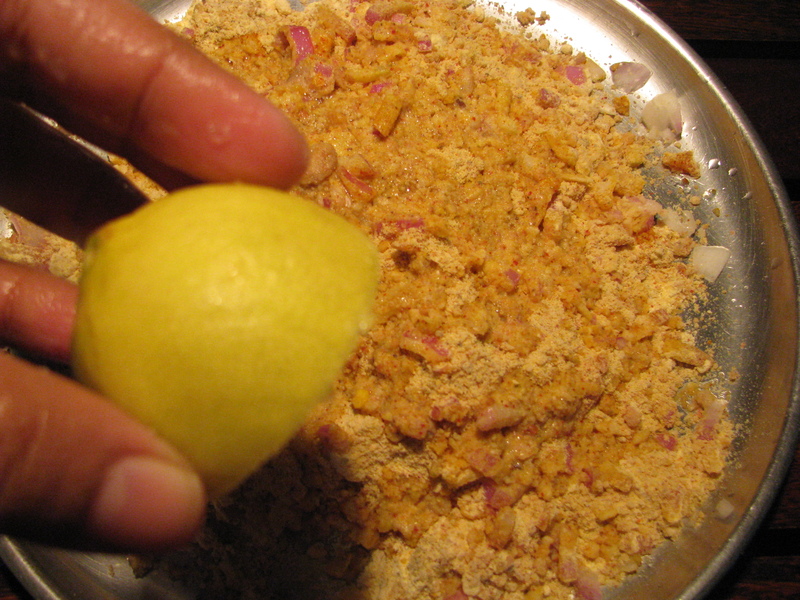 The sourness of lemon, imli (tamarind) or amchur (dry mango powder) reduce the bitterness of chili and makes it more tasty. I have variety of bharli mirchi / bharela marcha made by my mom and grandmother. My grandmother was more interested in “bharela marcha na bhajiya” i.e pakoda or bhaji made from stuffed chili. Well this recipe soaks lots of oil but was very tasty. Finally mom started making this fusion of gujarati and Marathi style stuffed chilli with the same basic ingredients and this recipes taste is almost same as stuffed mirch pakoda . I love this particular stuffed chili recipe . this stuffed mirch recipe is nice treat for your taste buds, you can eat it with plain dal chawal (waran- bhat /daal bhaat ) or kadhi chawal or kadhi khichadi or as a side dish with dal chawal sabj roti meal . 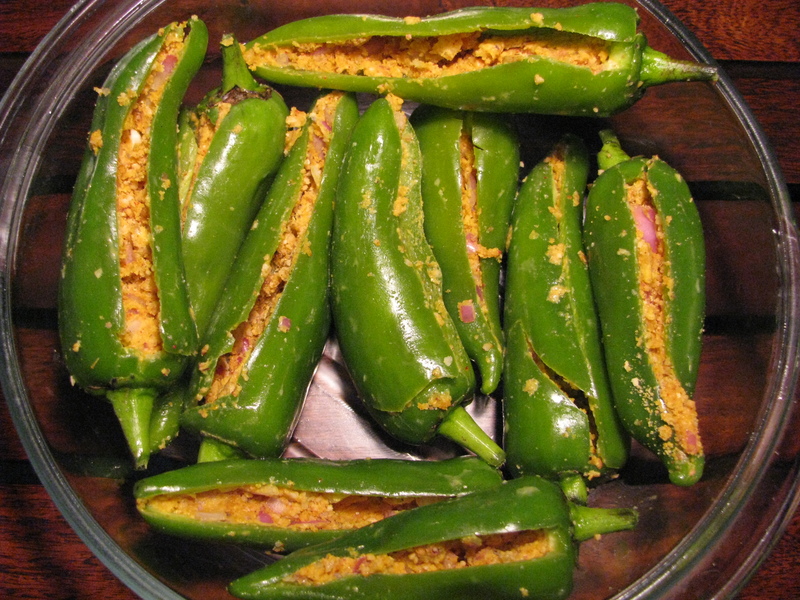 It’s not at all spicy as I have used thick bhavnagri Mirchi to make this recipe .this chilies are thick with juicy skin, they r not much spicy and if you don’t like spicy food just remove the seeds from it . to make this recipe pick fresh bhavnagri or thick chili . 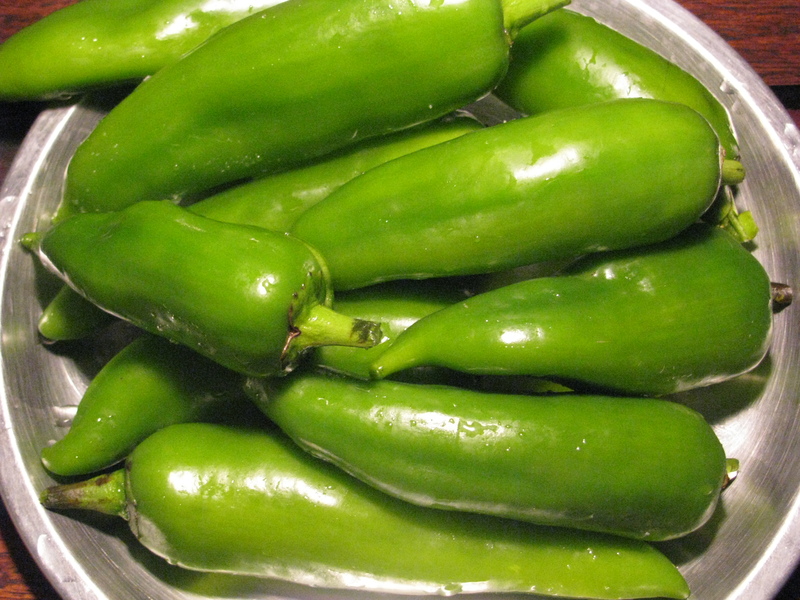 it should be unripe and look for crisp unwrinkled chili to make this recipe. When my mom made this recipe, she use to add lot of oil in her iron kadhai to make this stuffed mirch . it was very tasty but very oily .when I bought my microwave oven I was trying to make stuffed vegetable recipe and bhari mirchi / bharela marcha turned out really well .i have shared both microwave cooked version and frying pan version of his recipe . if your not using microwave oven you can cook this recipe in non stick pan with very less oil . Very less oil required to cook this recipe. Wash the chilies and trim its stem. Slit the chilies as shown in the picture. Don’t cut right through them, scoop out the seeds and discard them. 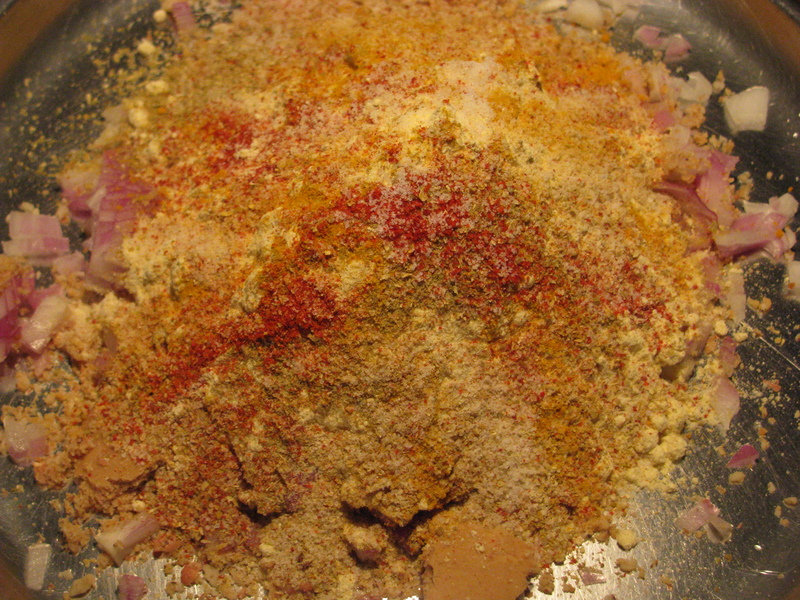 Sprinkle little salt inside each chilly and keep it aside for half an hour. 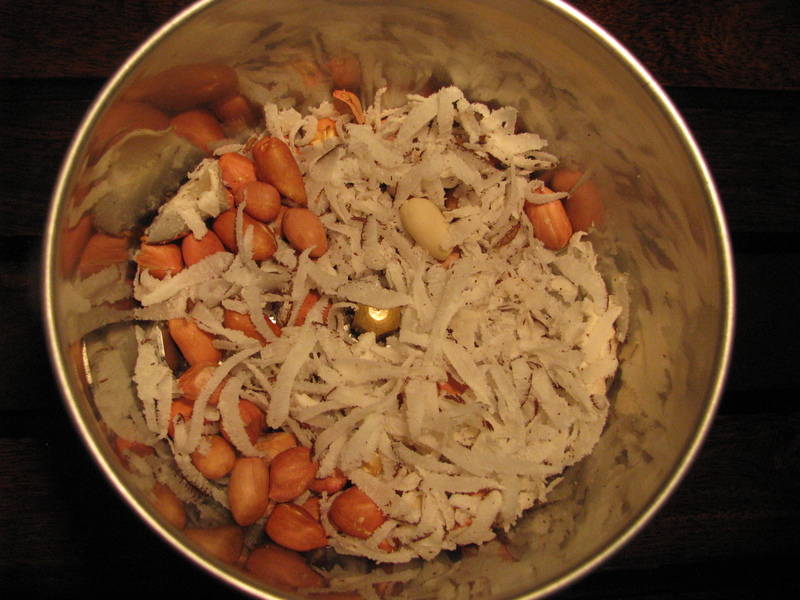 Grind peanuts and grated coconut. 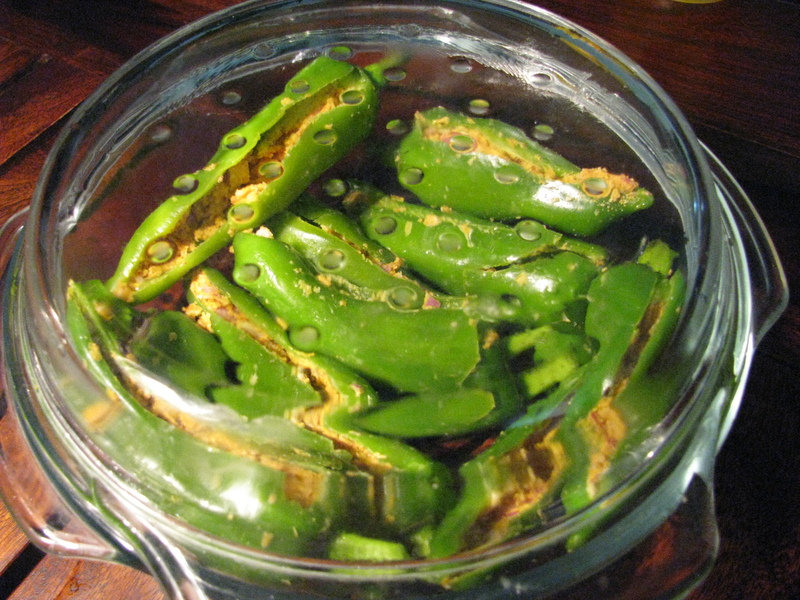 Take all stuffed chilies in microwave safe bowl, close the lid and microwave it for 6 minutes. 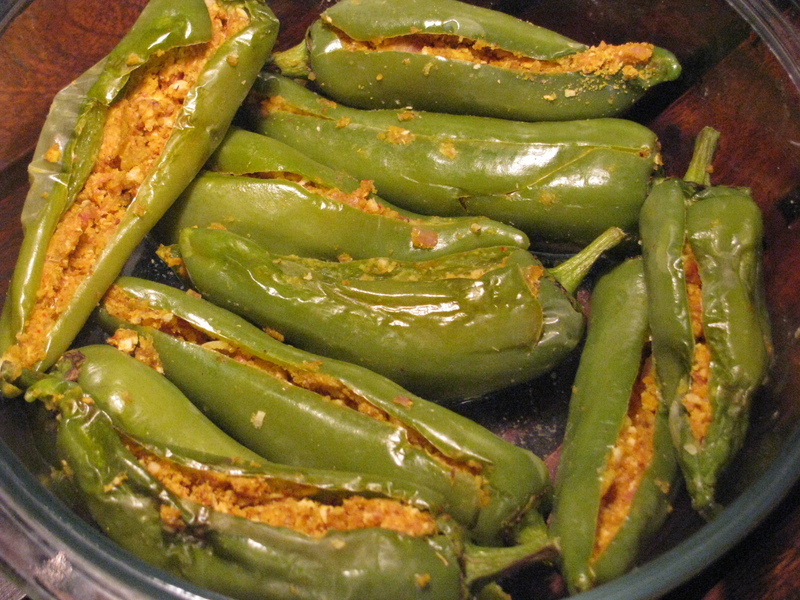 Heat the oil in a frying pan add cumin seeds and Asafoetida to it and then add stuffed microwave cooked chilies in it , roast it for 5 minutes and remove it from heat. Also check how to make Gujrati kadhi recipe this goes really well this bharela marcha/bharli mirchi . I liked your easy but heart warming recipe……..